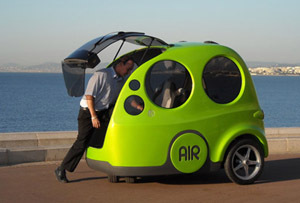 The AIRPod, also known as the Air Car (bubble car) produces zero emissions and runs on only compressed air. The prototype model has a top speed of 50km/h (30mph), with future models expected to be closer to 80km/h (50mph). Recharging can be done in as little as two minutes, and the car has a range of 140 - 200 kms (90 - 125 miles), but some infrastructure will be required, although much less than for proposed hydrogen refueling stations to support hydrogen fuelled vehicles. For styling, the AIRPod looks decidedly sci-fi with front and rear opening glass hatches, a joystick in lieu of a steering wheel, and a VERY distinctive bubble shape. The car is still at prototype stage with plenty of improvements planned, but AIRPods are already been booked to be trialled at airports across Europe, as both passenger and cargo shuttles in 2010. The expected starting price of €6,000 (US$11,700) for the 2010 release will be heavily reduced thanks to green car bonuses and incentives, meaning that air power could soon be coming to the streets near you!